The Form 471 application window is open. It will close at 11:59 p.m. EDT on Wednesday, March 27th. As a positive sign of funding waves to begin this spring, we’re already seeing certified applications being listed in a “Wave Ready” state. USAC issued Wave 43 for FY 2018 on Friday, January 31st, for $18.9 million. Cumulative funding as of Wave 43 is $2.13 billion. I am writing to let you know that I have been assigned as the new reviewer to your pending Invoice XXXXXXXXXX for XXXXXXX SCHOOL DISTRICT, and I have received the correspondence and other records related to this invoice. You can contact me using the information below. If we need additional information regarding your invoice, I will contact you directly. If you have any questions about your review, you can contact me using the information above. For all other questions about the E-rate program, please contact USAC’s Client Service Bureau at 888-203-8100. We are committed to resolving your invoice and appreciate your patience and cooperation as we work to improve the E-rate program. Although we have received a few reports of applicants and consultants receiving these “Erate Transition” emails in error, the outreach is a welcome development. We commend USAC for its efforts to make the Solix-to-Maximus review handoff more transparent. As discussed in the “Race for Certainty” article in our last newsletter, one of the important decisions we had been awaiting from the FCC following the government shutdown was resolution of a requirement to amortize special construction charges of $500,000 or more over a period of at least 3 years. This requirement had been suspended for FY 2015 – FY 2018 but, without Commission-level FCC action, was scheduled to kick back in for FY 2019. Amortization, if required, would make large network construction more expensive, complicate the E-rate application process, and disrupt matching funding programs in many states. The good news last week was the FCC’s release of a Notice of Proposed Rulemaking (“NPRM”) and Order (FCC 19-5) further suspending the amortization requirement for FY 2019 (and for the duration of the rulemaking) and proposing to permanently eliminate the requirement thereafter. Additionally, because this action comes in the midst of the FY 2019 bidding and funding cycle, the FCC Order directs USAC to identify any applicants who had already filed Form 471s for the coming year based on amortized funding and to give them the opportunity to amend their applications to request non-amortized funding. At this time, it is unclear how USAC will identify the impacted applicants and for that reason we recommend applicants affected by this decision proactively reach out to USAC. Comments on the proposal to permanently eliminate the amortization requirements will be due 30 days after the Order is published in the Federal Register. February 5-6 Four “After Hours” USAC webinars — beginner sessions on eligible services, FY 2019, and competitive bidding; and an advanced session on eligible services. February 8 Revised deadline for many FCC filings affected by the U.S. government shutdown that would otherwise have been required to be filed between January 8th and February 7th (see DA 19-26). The FCC issued a shutdown-shortened set of “streamlined” precedent-based decisions (DA 19‑30). Applicants facing similar problems as addressed in these decisions may garner useful information by carefully reading the additional FCC explanations found in the footnotes. The original appeal and waiver requests can be found online in the FCC’s Search for Filings. One Request for Waiver of late-filed Form 471 applications that the FCC deemed “timely” because they had been created at USAC’s request to allow for the effective processing of funding requests initially included on another application. Five Requests for Review and/or Waiver for ministerial and/or clerical errors on Form 471 applications. One Request for Review finding that a vendor’s invoice properly reflected services provided during the funding year. One application in a Request for Review and/or Waiver providing relief from a technical provision of state bidding requirements but rejecting support for unapproved services. One Request for Waiver to treat the failure to provide documentation of a vendor selection date as a clerical and/or ministerial error. One Request for Waiver for a late-filed appeal or waiver. With much of the Midwest in a deep freeze, it’s worth warning both applicants and service providers to be careful, not only of their own persons, but of their fiber systems as well. 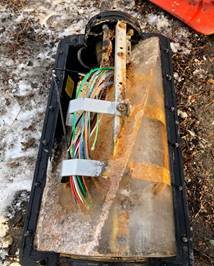 The photo below is of a frozen fiber splicing box recently pulled from a Wisconsin manhole 8’ underground. Network technicians note that even the routine handling of fiber cables at very low temperatures (e.g., below -20°) can cause serious damage to the fibers. Spring will be coming — eventually! All Requests for Proposals (“RFPs”) and RFP documents must be uploaded to the Form 470. Applicants must wait at least 28 days after the Form 470 is certified to select their service providers. February 27th is the last day to certify a Form 470 for FY 2019. Some changes in the scope of a competitive bid may require the posting a new Form 470. Last week’s News Brief also discusses the FCC’s new NPRM and Order (discussed above) on the waiving of the special construction amortization requirement. * USAC’s longstanding Business Process Outsourcing (“BPO”) long-standing contract with Solix expired December 31, 2018. The new contractor, effective January 1, 2019, is Maximus Federal Systems.